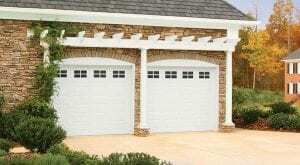 With so many different types of garage doors available to homeowners today, choosing the one that’s right for your Indianapolis, Indiana, home can seem daunting. No worries – 31-W Insulation is here to help. Since 1972, we have been the home improvement professionals that homeowners depend on to improve their homes’ comfort and functionality. As proof that we have the expertise to do the same for you, consider our consistent A+ rating with the Better Business Bureau, a distinction that reflects our unflagging commitment to total customer satisfaction in all that we do. Doors in a range of wonderful styles, such as carriage house, traditional, and specialty, and designs, such as Hillcrest, Heritage and Classica, for a variety of ways to enhance your home’s appearance. Additionally, all our garage doors feature SafeGuard pinch protection to reduce the risk of hand injuries, and a tamper-resistant bottom bracket to prevent parts under tension from being removed. Contact 31-W Insulation to schedule a consultation to learn more about all the types of garage doors we offer to Indianapolis, IN, homeowners.